This is a 1955 Thompson Thomboy, 14 foot, with a 1957 Johnson 35 HP electric start motor. The boat is in original, mint condition and it has never been restored. The only work done to the boat all these years is adding varnish coats to the decks and hullsides and repainting the bottom. She has her original factory applied varnish. The upholstery and seat cushions are original. I am the third owner of the boat. She spent most of her life on Pelican Lake near Rhinelander, Wisconsin. The boat was awarded "Most Original Best Preserved" boat at the Clear Lake Antique & Classic Boat Rendezvous at Clear Lake, Iowa in July 2001. This is a prestigious award from the Antique & Classic Boat Society, Inc. It also earned the "Angie Speltz" award at the Bob Speltz Land-O-Lakes Antique & Classic Boat Rendezvous in August 2001, held near Red Wing, Minnesota. 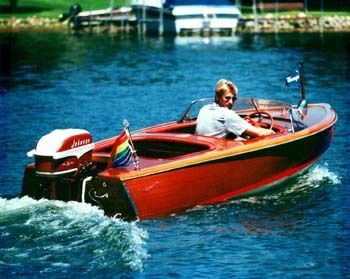 It received second place in the Outboard Boat category at the Geneva Lakes (Lake Geneva, Wisconsin) Antique & Classic Boat Show in September 2000.